See references at end for more information. A Twitter post yesterday by @sarchet62 (”Pills for your pets OMG http://is.gd/HuJH“) inspired me to finish a blog post I started two years ago describing our experience with Sassy, our rescue boxer, and her severe separation anxiety. My non-professional writing efforts often bog down, ending up in my drafts file never to be revisited. I dusted this one off today and updated it to reflect time passed and add some references. Sassy died in 2006 – I miss her to this day – so writing about her keeps her alive in my memory. Back in January 2007, a rescue boxer adopter asked a question on the Boxer Rescue Canada (BRC) blog about dealing with severe separation anxiety. Several people offered suggestions, asking for more information about the boxer in question, and as one of the responders noted, this can really be a difficult nut to crack. When we adopted our first rescue boxer, Sassy (who was our second boxer), we thought we were prepared for any issues that might come up as she settled in with us and we with her. We’d done a lot of reading, and I’m a member of the Boxer Mailing List (BML), a listserve for boxer lovers where people discuss all things boxer. Issues involving rescue boxers is a hot topic on the list. I’d been reading messages on BML about rescue boxers since we decided we’d like to adopt an adult boxer after our first boxer, Bridget, died in 2002. Not in our wildest imaginations did we think we’d be dealing with the kind of extreme separation anxiety Sassy displayed. It was a lengthy road helping her with it, while trying to maintain our own sanity. We discovered very quickly, the second day we had Sassy, when I headed out for a 10-15 minute walk around the block with our other dog, Ceilidh the pug, that there might be a problem. About half a block from home, I heard the most high pitched and loud frantic barking, which got louder and more urgent as we approached home. Our poor Sassy, it turned out, was terrified to have been left alone! Apart from wanting to alleviate Sassy’s distress, we live in a townhouse-style condominium and share walls with two neighbours and our ceiling with another – so we needed to find a solution to this and quickly. I spent the next day doing Internet research and posting to BML. Many, many people emailed with their suggestions and encouragement, saying it would, eventually, get better. And it did – but not for many months – and some aspects took several years. Crating Sassy wasn’t an option. She had spent the first four years of her life in a 6 x 6 foot pen in a backyard with a Rottweiler. The rescue worker we adopted her from – the wonderful now-retired Tracy Hon of Chico Boxer Rescue – had told us that Sassy was really claustrophobic and this turned out to be only too true. She was trustworthy loose in the house from the beginning, gentle with Ceilidh and not prone to destructive activities, but we just couldn’t go out and leave her, even with Ceilidh as company. Thus began many months of desensitization work. When I look back on that time, about six months of solid work and being trapped by this situation, I wonder sometimes how we managed to get through it with our sanity preserved. The bright and very shiny star in all of it was Sassy herself. She was such a sweet girl after our wild Bridget – she made all the hard work worth-while. She had us laughing out loud with her antics and her wonderful sense of the absurd. We count ourselves lucky because both of us had very flexible work schedules, which accommodated Sassy’s need to have at least one of us around most of the time. I worked in my home office two to three days a week at that time – and on the days I had to go in to a client’s office, Shelley would arrange to work at home or take Sassy to work with her. During the day, we would take breaks from work and do outings, gradually increasing the time every few days by 5 minutes at first, then 10, and so on. We set up a tape recorder so we could get a sense of how Sassy was doing – we didn’t want to be too close by, just standing outside the door or the hedge, because these uncanny creatures can sense our proximity. We thought we were doing pretty well until we reached the 30 minute mark after weeks of short, incremental increases in our absence. For some reason, Sassy couldn’t get beyond this mark without starting the frantic barking again. Following the wonderful advice from BML members and rescuer workers at BRC, we began with really tiny baby steps. We spent a few days preparing to go out, without actually leaving. We’d put on our coats, pick up our keys, and set the alarm system – then sit down on the couch for a few minutes before doing it all again in reverse. After a few days of that, we’d get ready to go out, set the alarm, step outside, lock the door, and then come right back in. (It had to be within 30 seconds at first, as that’s when the barking would start.) Over weeks, we worked up in this fashion to 10 minute outings, stuffing a large Kong with cookies and peanut butter to occupy her as we went out the door. Ceilidh, during all this, would get a plate with peanut butter or yoghurt smeared on it down at the end of the hallway (she’s always barked furiously for a minute or two whenever we go out the door). Along with the desensitization of short, then longer outings, key to the process was to keep comings and goings as calm as possible: a quiet “watch the house” when we left was instituted; a quiet greeting on returning – difficult when Sassy was turning inside out – and even ignoring her for the first 5 or so minutes replaced the usual happy greetings. Pills aren’t the first solution I reach for, but they have their place at times. Getting desperate since we couldn’t seem to break the 30 minute mark, we began to look at other options. We tried a citronella “no-bark” collar to no effect – other than to provide us with a lovely lemony scent when we came home. After weeks of this, we finally went to our vet about it, and she prescribed a drug, since we weren’t having success any other way (we’d been at it for about 6 weeks at that point, and still couldn’t go out for more than 30 minutes. We hadn’t wanted to go the drug route, but there it was –Sassy was prescribed Clomicalm (clomipramine). Although Sassy eventually could be left for a full work day, for those days when we both had commitments on the same day, she took several more years to adjust to evening absences. For some reason, she understood we’d come home again if we gone during the day, but she just couldn’t generalize that to evening outings. On the rare occasions when we both went out in the evening (hmmm, we happily lead rather quiet lives these days), we ended up hiring one of our neighbourhood kid friends who would come over and spend time with the dogs. It worked well – Sassy was happy and our friend would earn a few dollars, trading his usual herd of toddlers for a canine mini-pack instead. It took several years before we could leave Sassy at home in the evenings without a babysitter. Just at the point when we were planning to wean her off the Clomicalm to see how she’d do drug-free, Sassy had a grand mal seizure. It was frightening to see, as I’d never known anyone who had seizures. Shelley, though, knew just what to do, having grown up with a younger brother who had seizures regularly. She cradled Sassy’s head until the thrashing subsided and just let it run its course. We couldn’t help but wonder if Clomicalm was the culprit, and our vet (a boxer breeder herself) thought it was a possibility. As with many psychotropic drugs, withdrawal had to be gradual. Over a period of several weeks, we decreased her dosage bit by bit until Sassy was “off the meds.” As far as we know, Sassy never had another seizure – she may have had one when we weren’t around, but there were no obvious signs that she had. I remember an email from BRC’s Marta Nettelfield early on in our long road to getting a handle on the problem. She was very encouraging, saying it was early days – and she was right. We were glad to finally be free to come and go, knowing that Sassy’s separation anxiety was under control as long as she had her treat-filled Kong to entertain her as we slipped out the door. Behavior modification best medicine in treating dogs’ separation anxiety [news release from Kansas State University]. (2005). Available: http://www.k-state.edu/media/WEB/News/NewsReleases/listanxiety419.html. Humane Society of the United States. (2002). Separation anxiety. 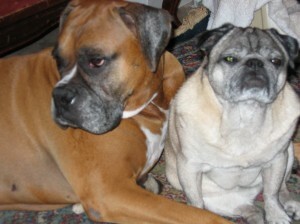 Available: http://www.hsus.org/pets/pet_care/our_pets_for_life_program/dog_behavior_tip_sheets/separation_anxiety.html. Humane Society of the United States. (2003). Solving barking problems. (Behavior series). Available: http://vetmed.illinois.edu/behavior/pdf/Barking%20Problems.pdf. Segelken, Roger. (1996). Study: ‘Nuisance-barking’ dogs respond best to citronella spray collars. Cornell chronicle. Available: http://www.news.cornell.edu/chronicle/96/6.6.96/barking.html. Seksel, K., Lindeman, M.J. (2001). Use of clomipramine in treatment of obsessive-compulsive disorder, separation anxiety and noise phobia in dogs: a preliminary, clinical study. Australian Veterinary Journal, 79(4), p. 252-256. PubMed abstract: http://www.ncbi.nlm.nih.gov/pubmed/11349411. UC Davis Center for Companion Animal Health. Companion Animal Behavior Program. (2003?). Separation anxiety in dogs: bibliographies, websites & resources. Available: http://www.vetmed.ucdavis.edu/CCAB/separation.html.